Many years ago I worked for a company that had a classic suggestion box system where employees filled out a form and submitted it only to wait an eternity to hear back on it. Why did they have to wait so long? Consider the path the suggestion would take. It would wait to be reviewed by a suggestion committee, who would then assign it to someone to investigate. The staff person it was assigned to would have to investigate the suggestion and then make recommendations on its merit as to whether it would be adopted or not. The suggestion committee would review the recommendations and if they agreed, they would need to assign a dollar amount to the suggestion and submit it to management for approval. Finally, when the reward was approved, a notification would find its way back to the person who submitted the original suggestion. Lead time for the process: 3 – 6 months. I can vividly remember one case of a chemical process that was unstable due to some inadequacies in the original design of the separators. The engineering redesign was priced out at >$100,000. Everyone was in a panic since customer demand was not being met. At this time a suggestion was received through the suggestion system from one of the employees with a remarkably simple idea on how to fix the process. The idea was tried out and proved to be very effective. Now followed a debate on how much to pay the employee for the suggestion. The debate centered on the usual process of paying out 15% of the savings. Since the process was inoperable and customers were out of product – how much was the idea worth and how could we possibly pay an employee that amount. The debate raged for months and finally the employee was awarded a token amount. 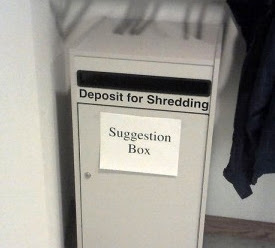 Needless to say, employees in this area never submitted another suggestion. Develop a system of Quick & Easy kaizen. This is a system where employees not only submit ideas but are charged with seeing them through to completion themselves. Progress of ideas through the process is made visible on a Quick & Easy Kaizen board so everyone can see the status of all ideas just by looking at the board. The approval process generally only involves the immediate supervisor and ideas can be dealt with through daily team huddles. The key is to generate lots of ideas and move them quickly through the process. To do this the Quick & Easy process has to be simple from the way to submit ideas to the approval process to the implementation and verification afterwards. Simple allows it to be fast. Simple pocket cards on a white board are all it takes. The experience of turning their ideas into action quickly creates employees who become supercharged and keen to submit ideas again and again. Imagine the power of an organization where employees are generating 10 and 20 improvements per employee per year. Not all will be big winners but there will be a lot of gems mixed with them. In fact, you’ll be surprised at how much buried gold you find. Go ahead try it. You can set up a Quick & Easy Kaizen process in an hour or two. What’s holding you back?